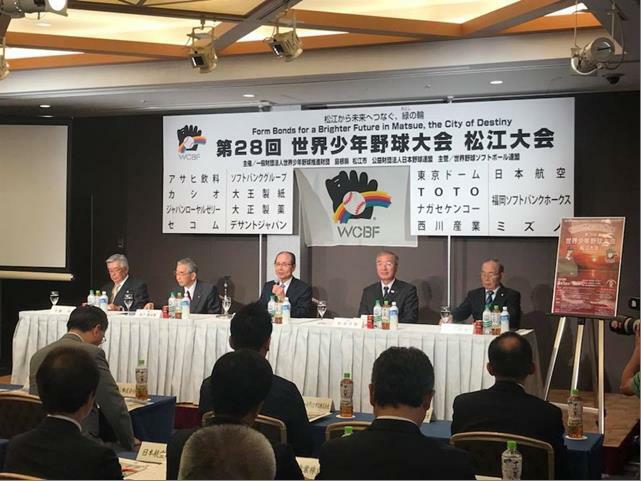 “Form Bonds for a Bright Future in Matsue, the City of Destiny” is the slogan for the 28th edition of the World Children’s Baseball Foundation (WCBF), announced at press conference in Tokyo on June 4. Sadaharu OH (78), WCBF President and former Tokyo Yomiuri Giants great who slugged 868 carrier home runs, in announcing the 28th WCBF in Matsue City, Shimane Prefecture for 9 days from August 1 to 9 hoped that this baseball event will set the stage for children to experience that “the World is wide” in Matsue, a place renouned for traditional warm sense of humanity. The girls and boys 10-and 11 years old will learn from ten veteran coaches of the World Baseball Softball Confederation to play baseball and participate in cultural and other sport events to create goodwill and friendship.